A lightweight ballistic helmet made of titanium: the OPTIO was specially developed for operational readiness and provides effective protection against bullet fire. Schwanenstadt (Austria) – ULBRICHTS Protection presents an innovation in the field of police helmets: a titanium ballistic helmet for operational use/hundred-man squads called “OPTIO”. In addition to the usual protection against knocks, stabs and projectiles, the OPTIO also offers effective protection against shots from a handgun (VPAM 2) for the first time. The OPTIO is thus the first helmet of its kind because a 9 x 19 mm Parabellum round can shoot clean through the helmets currently available to officers. Visually, the ULBRICHTS helmet is a helmet-mask combination which is barely distinguishable from the helmets in current use. It is therefore possible to use the OPTIO in combination with other helmet models. It weighs about two kilograms, including an impact-protection visor and stab-resistant neck protection, which again make it similar to current helmets. The quick-size system made famous by ULBRICHTS Protection also enables a true “pool solution” since several policemen can share one titanium helmet. 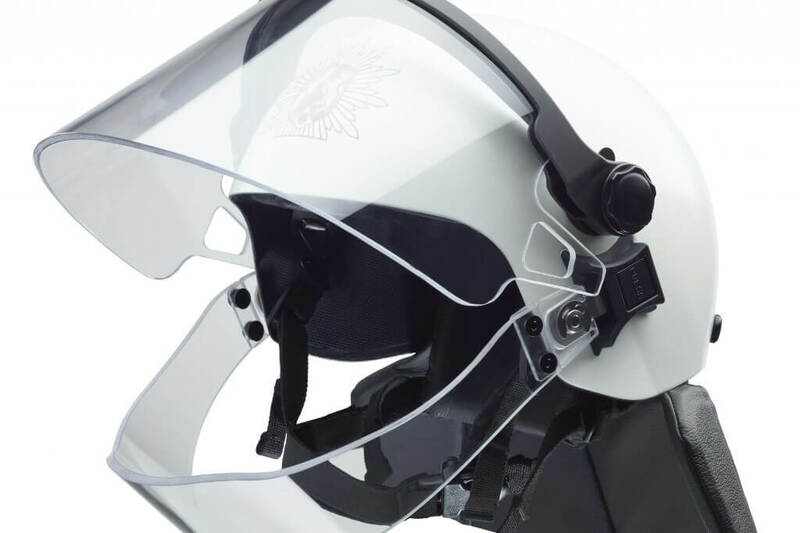 A rotary knob at the back of the helmet makes the inner helmet system infinitely variable and capable of being set within seconds in hectic situations without further adjustments. OPTIO can be set to head circumferences measuring from 48 to 62 centimeters. In addition to the persuasive protective performance provided by titanium, both the police and procurement officers have been equally convinced by the sophisticated quick-size system in particular. The OPTIO complements the “ZENTURIO” (Special Units) and “HOPLIT” (Patrolmen) series of helmets made of titanium. ULBRICHTS Protection is the only manufacturer to offer a modular helmet concept for the various units and purposes within the police force. The three helmet models are consistently tailored to the need to protect their wearers and can be configured according to customer requirements. 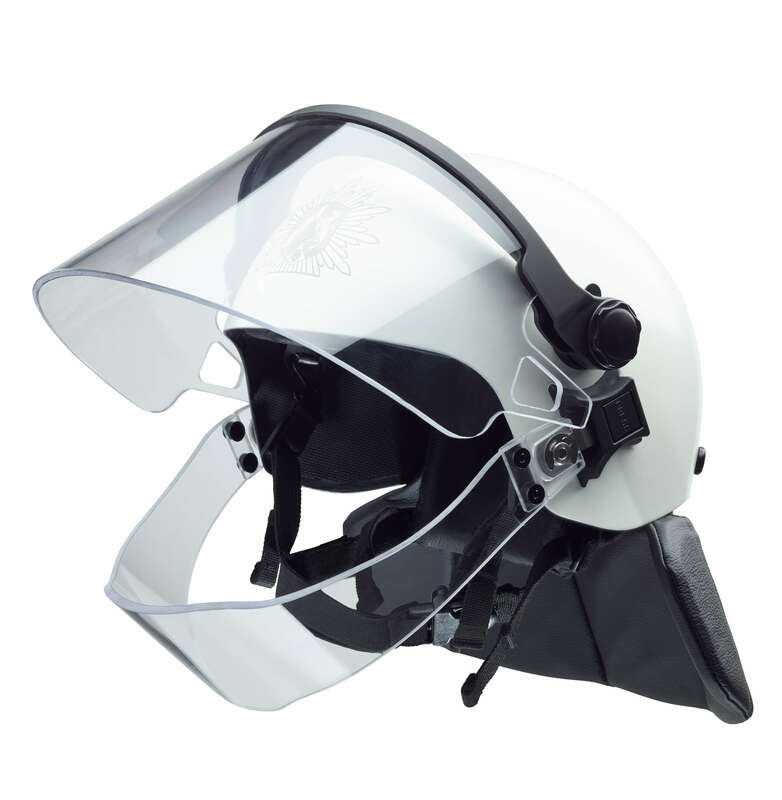 ULBRICHTS Protection offers among other options different helmet cuts, hybrid variants (a titanium-aramid composite), finishes and visor types, as well as adapters to enable the attachment of further accessories. Titanium helmets have been used by special forces for over 30 years. In view of the threat posed by international terrorism, 12 of the 16 German federal states have recently decided to procure ballistic protective helmets for patrolmen. 90% percent of the helmets are “HOPLIT” titanium helmets made by ULBRICHTS Protection. Up to now, no ballistic helmet was available with a suitable weight in the field of operational readiness/hundred-man squads. The “OPTIO” fills this gap. Effective ballistic head protection will also be available nationally for the first time. Titanium helmets provide effective protection against bullets and other dangers in police operations. Compared to ballistic helmets made of polyethylene (PE) or aramid, titanium is able to stop a projectile up to 15 millimeters from the edge. PE/Aramid helmets, on the other hand, are bulletproof only in the centre of the helmet shell. Titanium helmets therefore offer the greatest possible effective protected area. At the same time, the material prevents a life-threatening trauma to the helmet wearer. The so-called “trauma effect” can arise with PE/aramid helmets, since the helmet material is deformed strongly on the impact of the projectile and thus acts directly on the head. As a result, the protection these helmets offer is severely limited. All ULBRICHTS titanium helmets are tested and certified in accordance with VPAM testing standards developed in Europe and the Technical Guidelines of the Polizeitechnisches Institut (PTI). The trauma values are also measured according to strict guidelines in ballistics tests. How important a ballistic helmet can be in police operations was demonstrated at the end of July 2017 during a shootout at the “Gray” nightclub in Constance in south Germany. A policeman survived a gunshot from a machine gun thanks only to his ULBRICHTS Protection titanium helmet. In Baden-Württemberg, titanium helmets have been part of the equipment of patrol units since 2011. ULBRICHTS Protection in Schwanenstadt (Austria) is a division of ULBRICHTS Witwe GmbH which manufactures ballistic helmets made of titanium and titanium aramid (hybrid). The company’s international customers include special police forces, police units and the military. The company is one of the pioneers in the field of ballistic head protection and regularly sets new technical standards in terms of protection, comfort and design.